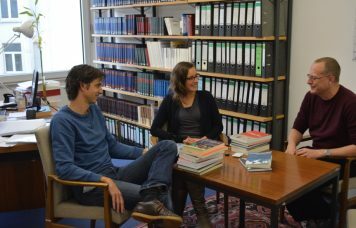 From August 6 to 10, 2018, Nicolas Bouchet, a returning EDP guest researcher, once again joined Annika and Jonas at PRIF. Nick is a non-resident research fellow at the German Marshall Fund specializing in U.S. foreign policy, democratization and democracy promotion. Currently, he conducts research on the challenges and prospects for US and EU democracy promotion in post-Soviet countries, and on relations between the United States, the EU, and Russia more broadly. During his previous research visit at PRIF, Nick published an EDP Wire on U.S. democracy promotion during the Trump presidency. In the Wire, Nick discussed the Trump administration’s linking of democracy support to the pursuit of US security goals and the potential damage this could do the fledgling efforts at collective democracy-building.